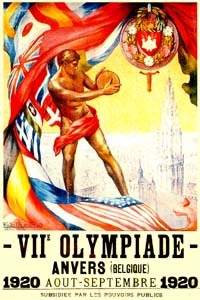 Hockey was included for the first time at the 1920 Antwerp Summer Games. The Congress of the IIHF used the occasion of this tournament to admit Canada and the United States into its membership. The participation of teams from Canada and the U.S. helped to adjust the rules of both the IIHF and the Canadian game. Teams played six players per side, the rover having been dropped at the IIHF Congress in March of 1912, and players could only be changed when the action was stopped. 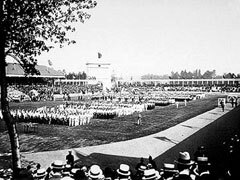 The 1920 tournament was played on a rink that was different in size from that prescribed by the IIHF rules. Seven nations were represented, but the first face-to-face confrontation of hockey players from the old and new worlds showed the overwhelming superiority of experienced North American players. Playing for Switzerland at the tournament was IIHF President Max Sillig, the only president in the history of the sport to take part in the World Championship while holding office. It was not until the 1983 Congress of the International Ice Hockey Federation Congress that this tournament would be accorded the title of the first World Championship of ice hockey. The Winnipeg Falcons represented Canada and became the first World Champions. The Canadians easily defeated Czechoslovakia 15-0 in its first game, edged the United States 2-0 in the second then trounced Sweden 12-1 to win the gold medal. The three teams beaten by Canada then played for second and third place. The United States finished second with a lopsided 16-0 victor over Czechoslovakia. The Czechoslovaks in turn took the bronze medal by shutting out the Swedes 1-0. The tournament's format was flawed. Sweden played six games and won three, as many as Canada and the United States. But the Swedes still finished out of the medals because of their 1-0 loss to Czechoslovakia. Canadian Captain Frank Fredrickson later went on to fame in the NHL and was elected to the Hockey Hall of Fame. Frank "Moose" Goheen of the American squad would also be accorded that honor, in addition to winning a spot in the U.S. Hockey Hall of Fame.